James' Jetsam - Your Cruise Expert: Should kids cruise free? "I'm not paying for my child, he's only two", or, "I'm not paying gratuities for my 10 month old, why should I?" As a Father myself of a three year old boy and a one year old girl I would never dream of expecting this on a cruise. and I'll tell you why. I actually think kids use 'more' of the ships resources than adults do. On a typical sea day your average adult may hang out by the pool, go to a bar, (and spend money), go to a spa, (and again spend money), or just relax in their cabin. A child on the other hand will spend a large chunk of the day in the kids club, (for free), taking up the time of several members of staff and I've never yet met a waiter or cabin steward who didn't bend over backwards to keep children happy and entertained. They'll go through the menu with them and if they don't like anything they see I've known them to ask the chefs to prepare something else. Quite a lot of cabin stewards will leave towel animals in the kids cabins for no other reason than to make them smile when they get back. These are just two small examples of the extra lengths cruise staff go to give kids a great holiday. Anyone with kids will also tell you they create a lot more mess than adults, again causing more work for the waiters can cabin stewards. And depite all this many parents still expect and demand their children to cruise free and refuse to pay gratuities for them, stating, "oh, but they're only little, they're no bother". Don't get me wrong, I know how expensive cruising with a family can be so if the cruise lines decide to release free child places on particular sailings, by all means take advantage of it. But don't expect/demand free/cheap child places as a matter of course, It's just not fair to the staff. And as for the people who refuse to pay the gratuities for their children, I just think that's plain wrong. What do you think though? 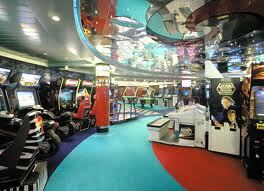 What have your experiences been with your children on a cruise ship? D you think they got extra attention from the staff and do you tip for them or not? We opted out of the children's gratuities as they didn't go to the Kids club staff. We gave them the equivalent cash tip instead as they deserved it! They were wonderful. There are some people that simply should not be allowed on a cruise ship, they simply spoil the cruise for others by their behaviour which is even worse than their spoilt brats and have a totally selfish attitude. I would not let children on my cruise ship for free or otherwise. Remember we were all kids ourselves once, and I don't know about you but I was NEVER a brat and nor is my well behaved 13 yr old son. Some people are so touchy wow! I think you are missing the point - our "child" cruiser was only 6 months old - all the extra provisions provided was an extra pillow to make sure he did not fall out of the bed.Mom did all the rest by taking all his baby food provisions etc..And he was charged full child fare anyway. So why no tan age limit and sliding scale for use of facilities?